Rampage is the biggest drum & bass and dubstep party in the world and it returns to the Belgian city of Antwerp from March 29th to 30th for the 10th anniversary of the event, with another monstrous line-up featuring the likes of Excision, Andy C, Sub Focus, Wilkinson, Dimension, Funtcase, Dion Timmer, DJ Hazard, Herobust, Murdock, Macky Gee, DJ Hype, Alix Perez, Drumsound & Bassline Smith, Dubloadz, Feint, Fox Stevenson, Koven, MC Mote, Spag Heddy, Tantrum, Desire, and tens more. Always one of Europe’s biggest gatherings, the event successfully expanded to two days in 2018 and does so again this year with more than 30,000 people expected to attend each day, flying in from more than 55 different countries. To match the huge scale of the event, the line-up is equally giant with the biggest names in the scene, from fresh up and comers to enduring legends. Audio visual production is also out of this world and is part of the reason this event has become such a regular pilgrimage for drum & bass fans around the world. 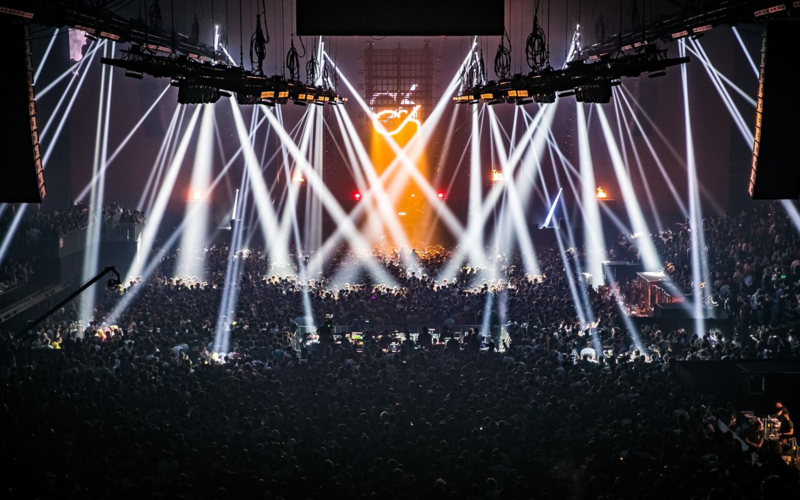 All this goes down at The Antwerp Sportpaleis, one of Europe’s largest indoor spaces and one that becomes a mesmeric and immersive rave haven thanks to the light, lazer and visuals production that’s on the level of Tomorrowland, Awakenings and EDC, or even surpasses it. Heading things up is Excision, the North-American producer who has become the most in-demand artist in the bass music world, largely thanks to an insane level of visuals and production, which he will all bring to Rampage. He has released on deadmau5’s mau5trap label but has mainly been pushing his music on his own imprint and in late 2018 he released his fourth studio album Apex. He’s been at the forefront of a musical revolution that has squashed all competition in North America and is bringing through tons of new artists. Sub Focus and Wilkinson had a huge summer playing for Together in Ibiza so bring their widescreen bag of multi-genre tricks, Critical Music and Shogun Audio star Alix Perez is one of drum & bass’s most revered and stylistically hard to pin down producers and then come legends like DJ Hype as well as Ram Records boss Andy C who is a long time godfather of the scene, and DJ Hazard, a close Playaz and Ganja Records associate who has defined the scene for twenty years and played regularly at Fabric with the famous Playaz party. You can also look forward to hot young stars like Feint from Liquicity Records and Monstercatt, liquid, dubstep and house producer Fox Stevenson plus Funtcase, who played at Rampage 2018 and was one of the year’s standout acts. For big bass look no further than Herobust from Mad Decent, while founding father Murdock brings his fresh club styles and jump up man Macky Gee is coming off the back of his fourth and most confident album to date. Tens more names like Dubloadz, Drumsound & Bassline Smith, Fox Stevenson, Benny L, Bredren, Bukez Finezt, Infekt, K Motionz, Muzzy, Signal and Skeptical all bring a broad array of styles to complete this famously supersized party, and these are not even half of all the acts that will be playing the Rampage 2019 Weekend. The countdown is now on to Rampage 2019, which promises to be the biggest and best edition yet.